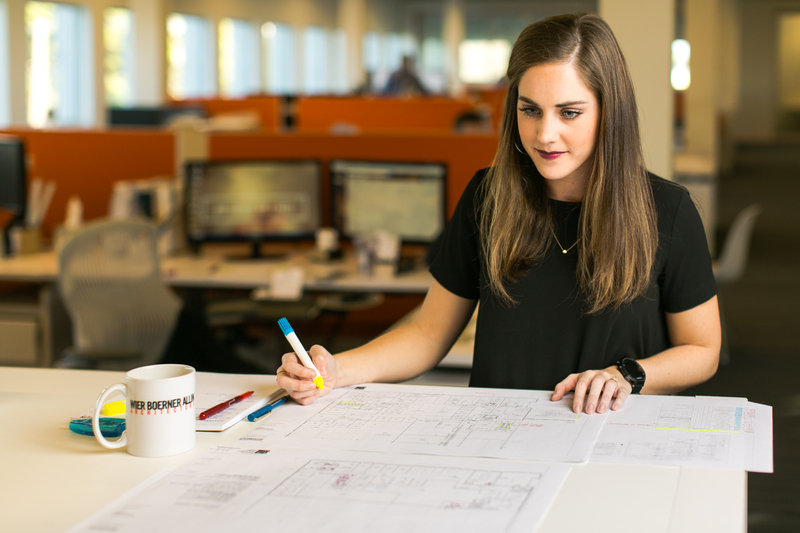 Interior Designer Molly Diffee joined WIER BOERNER ALLIN Architecture just over three years ago and since that time has poured her talents into projects such Ed’s Burger Joint in Hattiesburg, Forman Watkins, Dudy Noble Field at Mississippi State University, and the Alpha Phi Sorority house at Ole Miss, among many others. She brings a broad range of experience to the firm, including high-end hospitality, residential, and commercial design. As cheesy as it sounds, I can remember watching Trading Spaces on HGTV as a young girl. This show inspired me to re-design my own room at the young age of nine. My very brave mother helped me pick out the perfect comforter then took me to the Benjamin Moore store where we spent hours sifting through countless paint decks and wallcovering books until I found the perfect ones suitable for my design. This inspiration continued as I took many art classes throughout school. Even as a 12-year-old, I remember giving various opinions to my parents as they designed and built our family home. I would say the Alpha Phi Sorority House at Ole Miss. I was privileged to be a part of this project from start to finish. My contributions included programming, space planning, interior architectural finishes, lighting and even furniture and accessories. This project was our first to have a hand in every detail, down to the flowers on the table. Seeing every single part of this 26,000 square-foot home through was very rewarding. One of my proudest moments as a designer was going back for the ribbon cutting to see the building working perfectly for the girls and knowing their new home at Ole Miss was everything they dreamed of. Why did you choose commercial rather than residential design? In commercial design, we have so many different types of clients who come with their many different design preferences. At WBA, we have project types ranging from athletic facilities, churches, banks, restaurants, and many more. This allows me to work on as many as eight projects at once that are all extremely different. I love the opportunities this creates for me to grow as a designer and a professional. Everyone at our office jokingly asks to check my temperature when I use color in a project so I would say “simple.” I love using monochromatic schemes, lots of gray, white, and other neutrals. I also enjoy using simple details that make a big impact. What do you do when you aren’t designing show-stopping spaces? I love spending time with my husband Grant and our golden retriever Henry. We love taking Henry on jeep rides, swims in the lake, and walks through our neighborhood in Madison. I am also an avid runner, you can usually find me training for some kind of race, short or long distance. We have found an awesome community at Fondren Church where we spend time with friends in small and large groups weekly.